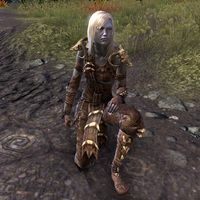 The Kothringi were thought to be exterminated by the Flu, although some of the infected fled on the Crimson Ship westward, away from Tamriel, never to be seen again. However, legends abound of those who supposedly saw the ship and never lived to tell the tale. Despite the widespread belief of the race's extinction, several Kothringi survived the Flu through unnatural means. In 2E 561, the chief of Stillrise Village, a Kothringi settlement in Shadowfen, entered into a desperate pact with Clavicus Vile in order to survive the disease. The Daedric Prince kept his end of the bargain, but did so by transforming the populace into immortal, undead skeletons. The villagers maintained appearances through illusion magic, but their secret was discovered in 2E 582 when the Order of the Black Worm attempted to enslave the undead inhabitants. The villagers successfully repelled the necromancers, but infighting broke out, and it is unknown if they chose to destroy the curse or continue living as skeletons. In the nearby town of Zuuk, a lone Kothringi man named Drillk became immune to the Flu by absorbing the power of a keystone. He was targeted by both the Aldmeri Dominion and the Ebonheart Pact in 2E 582, when both sides sought to acquire the keystone. The Pact rescued Drillk from the Dominion invaders, but the Kothringi revealed that taking the keystone's power would kill him. It is unknown if the Pact took his life or not. Little detail is known about the Kothringi. They generally preferred to go naked, although a few wore clothes when outside their native land. They appear to have worshipped a god named Z'en—a God of Toil— as well as Dibella, Mara, and Kynareth. [OOG 1] Kothringi knights made up a large part of the imperial garrison of Gideon, and Empress Tavia, wife of Reman III, the last ruler of the Reman Dynasty, had a Kothringi knight named Zuuk with whom she conspired to assassinate her husband. After Reman III was assassinated, "Lord" Zuuk returned to Shadowfen and founded a town which was eventually named after him. Esta página foi modificada pela última vez à(s) 03h54min de 16 de agosto de 2015.